Best Android Tower Defense Games: Little wonders what a game can do for you especially if it is one of the best tower defense games in 2017. There are much more benefits that can be derived from installing a game on your Android, iPhone, or PC. Tower defense (TD) is a subgenre of real-time strategy video games, where the player's goal is to defend their territory by obstructing enemies, usually achieved by placing defensive structures on or along the path of attack. The reason for their popularity isn't farfetched. Tower defense games feature simple control keys for touchscreen smartphones, which aid in navigation. The ease of navigation through the game makes it easy to be played the basic smartphone user even if it's their first time of playing that particular game on their machine. Let's not also forget the humorous features that come with the games. Bloons TD 5 is one of the best tower defense games for Android phones. It has monkeys as characters and a set of balloons as your enemies. In Bloons 3D, you can build towers, hire Special Agents to work for you, and pop balloons every now and then. This game presents 3 game modes, 21 towers one must climb, about 50 levels, 10 individual agents, 10 special missions and over 250 random missions. The higher the level, the more skills you'll need to win to move on to the next. Not to fret, there are 3 difficulty modes in this game, that being so, you can move from one level to the next while playing at your most convenient mode. The sound quality of this game is good, and its HD graphics makes it a delight to the eyes. If you're looking for the best, then Bloons TD 5 developed by Ninja Kiwi should be your first stop. Tiny Guardians is a game mainly for the ladies, but guys can as well get some humor and amusement from this game. In this game, you are a girl in search of sorcerers that can perform some magic to summon guardians for support. Co-joined as a team, you all will defend yourselves from the 40 different enemies using different strategies. The game includes 4 levels, where each level tells a unique story. There are also special events and a challenge mode with three difficulty modes. Defenders 2 is a strategy game that is a combination of tower defense and collectible card game. It has 40 towers, each of which must be unlocked to move to the next higher tower to acquire cards. Other than its towers, there are 20 deadly spells, 29 unique bosses in this game, and you get to battle in different weathers like tornadoes and storms. There are about 20 monsters in this game, some of which go by the name Underground, Intelligent, Swarming, Exploding, and Phantom. Its free version is excellent, giving you prolong hours of gameplay before you are distracted by ads. The Plants vs. Zombies is a humorous adventure game, and It is one of the most popular even though it was released far back in 2009. Here, you get to battle with zombies using plants like Sunflower, Peashooter, Lava Guava and Laser Bean that you'll boost with plant food to be able to fight the zombies. You play against your enemies by burying weapons in the form of plants around your home to serve as a hindrance to them. Defense Zone 3 is a strategy game that features new weapons, landscapes, and several challenging game modes for different territorial zones you are to defend. Using the budget assigned to you, you can buy as many weapons as you'll like, to defend your territory and also train yourself for the battles ahead. With several battles to be won, this game can keep you entertained for the rest of the day. Other features of this game include 4 difficulty levels, 8 turrets and special abilities, different seasons and landscapes, and support for over 20 languages. Coupled with great graphics and sound quality, you might just have a less uneventful day. Another tower defense game for Android is Digfender, and from its name 'Dig,' you're required to do a lot of digging in your quest to defeat your enemies. With a shovel in hand, you are required to dig deep into the earth to uncover treasures and ancient artifacts that will help you in your mission. The treasures you uncover will help you build towers, set pitfalls and cast spells on your enemies. There are over 70 levels and 5 upgrade trees in this game, and also a survival mode allowing you to compete with your friends to have your name on the Leaderboard. 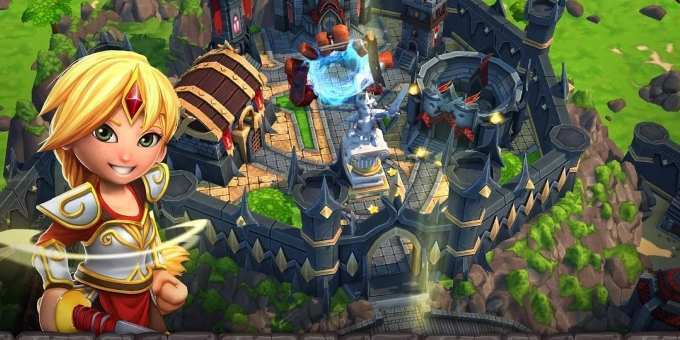 Here's one more to add to the list of the best tower defense games for Android 2017. It is Grow Castle, a strategy game that provides the gamer with a castle to defend in the best way they can from the attacks of the enemy. There are 120 heroes in this game to be selected from as your most preferred, and each has its own unique power to become the active archer of the town. The logic behind this game is that you are a guardian defending your dungeon by battling with your enemies using weapons. Dungeon Defense provides a field with a left border and weapons, where your defenders will be on standby to defend your domain from being overtaken by your enemies. Win or be defeated, the Retro graphics & sounds of this game makes it a must install as its worth every minute you'll spend playing it. Nature, Earth, Light, Darkness, Water, and Fire to determine the type of tower to be built. There are other features which include a difficulty settings mode, 44 towers in defending, 5 maps to lead you, 50 creeps to fight off, and 30 achievements to complete. Allows you to connect online, compete with your friends and other players for an opportunity to be on the world's Leaderboard. The graphics are simple; hence you should not expect a fancy design in this game. On the other hand, Samsung Galaxy 3 and Nvidia SHIELD are not supported by Element TD game. Kingdom Rush is an action fantasy defense game for Android and Tablets. It is part of the trio in the Rush series, the others being the Kingdom Rush Frontiers and Kingdom Rush Origins. All three have the same logic of the player as being on a quest to save a Kingdom from the forces of darkness, but a different approach to fighting off enemies. Command your troops to lead them to victory. The best tower defense games for 2017 at your fingertips. Download, Install and Play to make your day a memorable one.